It's ALL Grade A! New Hampshire has a mandatory maple syrup grading law. NEW grades provide better descriptions, with each of the classifications having a color and flavor description, helping our customers pinpoint the exact syrup they want to purchase. 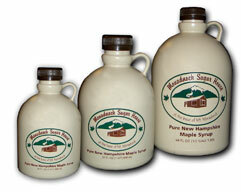 Pure NH syrup must adhere to some of the strictest standards for density, clarity, color, and flavor. Maple inspectors enforce these laws and assist producers in maintaining high standards and superior quality in their maple products. New Hampshire is now using the same grades as other states and provinces creating less confusion in the marketplace. The first runs of maple sap in the early spring make the Grade A - Golden with Delicate Taste syrup. This treasured syrup, with its delicate maple flavor, is used to make maple cream, candy and sugar. Many prefer it as a table syrup. This syrup was formerlly known as "Light Amber." Gradually, as the maple season progresses, the syrup darkens a shade to Grade A - Amber with Rich Taste. This product bears a richer maple flavor and is great for pouring over pancakes, ice cream or oatmeal. This grade is also used for making maple cream and sugar. Formerly known as "Medium Amber." Nearing the end of the 4-6 week season, the syrup darkens again to Grade A Dark with Robust Taste, which is also a choice table syrup. With its stronger, more robust maple flavor, it can also be used for cooking. If you ordered Grade B in the past, this is the syrup you would order.